There’s no law that says a Christmas tree has to be a pine. When I was a kid my neighbors always cut down a big Manzanita bush for their tree. Manzanita works well because the twigs are rigid and support the weight of ornaments and lights well and the very spare foliage neither wilts nor obscures the smooth, red, and muscular, twisted branches. 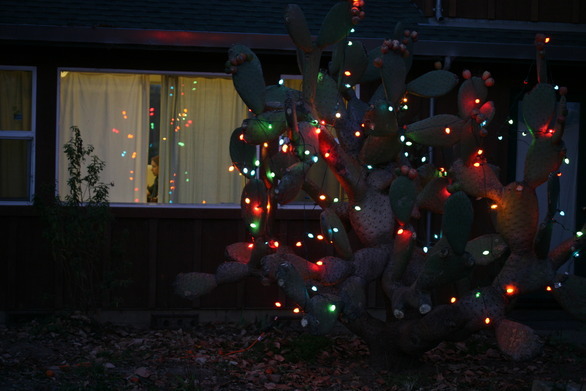 Some people might say that Manzanita isn’t a very traditional choice for a Yule tree but community consensus over tradition isn’t one of our strong points here in California; Me, I like the outstretched arms of a cactus tree to hold up my string of lights. My Christmas cactus is a prickly pear that I have pruned and shaped for 25 years. I’d been on a hiatus from farming, doing some ornamental gardening in Santa Barbara, and I’d learned to appreciate xerophytic landscaping. The last thing I did before I moved to Watsonville was cut a cactus paddle from a favorite plant near the Mission to plant at my new home. Now the plant dominates our yard. 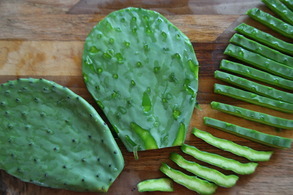 My intentions were ornamental but the Mexicans I lived with gave me a working vocabulary for my cactus; the plant itself is called a nopal, the paddles are called pencas, the fruits are tunas, and nopalitos are the tender, young pencas that are harvested and cooked. Nopalitos taste not unlike green beans. I like them. 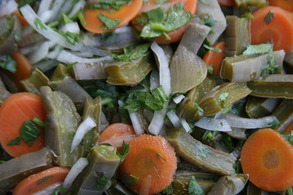 In Old Mexico they are traditionally served with eggs or beans at breakfast. Considering how nutritious nopalitos are, how economical the plants are with water, and how hardy they are, the Nopal cactus may be the most under-appreciated vegetable resource in the world. My photo of the Christmas cactus is a “seasonal” picture for us, because not only are colored lights “seasonal,” so is the reflective mood the lens captured. December is one of the quietest months on the farm. We don’t do much planting now, although I will put in some lettuces this week for March harvest. Mornings can be frosty, so we often start the harvest late, so as not to damage our crops by handling them. Night comes early, so we stop work early. December is a good time of year to slow down, look back on the things that worked, ruminate on the things that didn’t, and catch up with all the undone tasks. For her part, Julia has been plugging away at the computer, revising the recipe files for the website, linking photos to recipes, and in general trying to make the “web support” we can offer our CSA subscribers as useful as possible. She’s giving me a list of vegetables we need photos (or better photos) for so that I can remember to “capture them on pixel” the next time I have the opportunity. I’m giving her all my nopal pictures now. We wish you all a reflective and peaceful holiday season too. © 2011 Article and all photos by Andy Griffin. ** Julia’s note: the Nopalito recipe page has a couple of recipes from a thorough cookbook I got from my grandmother: The Cactus Cookbook: Succulent Cookery International, published 1971 by Joyce L. Tate and the Cactus and Succulent Society of America. It has hundreds of recipes: many of which would pass any slow food test, many others that are bizarre concoctions that include jello and other canned vegetables/fruits. I looked on ABE books and there are many copies available for those of you interested in making your own Opuntia Jelly, Cactus Pear Harvest Relish, Nopalitos Souffle, Stuffed Cactus Stems with Cheese, Prickly Pear Beer, Barrel Cactus Pudding… you get the idea!